There are six charging points available on the TU/e Campus, two at the MultiMediaPaviljoen, two at the Auditorium, and two on the parking place between Gemini and MetaForum (see map). Also there are two charging points available on the MMS-side (for TU/e employees). The charging poles on TU/e Campus are an initiative of the TU/e and Innovation Lab. 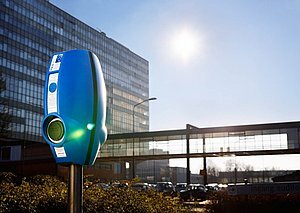 Drivers of electric vehicles can tank by means of an EV charge card with a so-called RFID reader. EV-Box takes care of the billing and sends the invoices to the owners. They charge a standard price of 24 cents per kilowatt-hour. 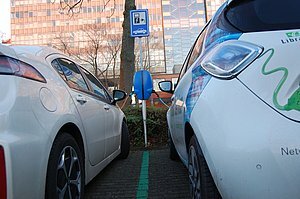 The card gives access to all (semi-)public charging points in the Netherlands. The cards provides TU/e on-line insight into the power consumption. This enables to see how many kWh have been charged and how much that has costed. Regularly, EV-Box will roll out to all its charging points with a subscription a new firmware update. This update will enhance reliability, fix minor issues, and improve stability in all EV-Box charging point network. Improved Smart Charging: Changed EV-Box Smart Charging to make ever better use of the available power in the grid, resulting in a faster and better charging experience. Flashing Red: Your charging card is not authorized to start a session. Fixes & Enhancements: We've fixed minor issue with program card functionality, time and date sync, and high data usage, amongst many other improvements for better charging experience and management. With this update, we believe that your charging experience will be better as well as the usage of your charging station.